Windows 10 Mobile has made much of a splash in 2016 but Microsoft is hoping to accelerate its smartphone endeavours through a new partnership with Qualcomm. Qualcomm and Microsoft have announced they are working together to bring the Win32 emulation to next generation Qualcomm Snapdragon processors. If things go as planned, the next generation mobile Windows 10 devices will be able to run games like Crysis 2 and World of Tanks, as well as hundreds-to-thousands of apps previously unavailable to Window 10 Mobile. One of the biggest hang ups we have with Windows 10 Mobile is the lack of apps available through the Windows Store. Although, Microsoft has made strides to bring more apps into the fold with the Universal Windows Platform, it still hasn’t been enough. And when they are available, they're often missing features available on their iOS and Android counterparts. By introducing emulation though, ARM-powered devices could start running desktop x86 applications such as Google Chrome, iTunes and Slack. We’ve already seen the dream of desktop applications emulated on a mobile Windows device with the HP Elite x3. 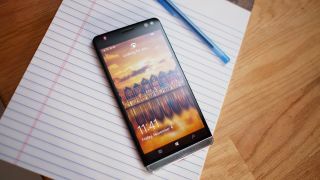 However, this enterprise-minded smartphone only offers this functionality though a subscription service – but Microsoft’s new partnership with Qualcomm could turn this into a standard feature on all future Windows 10 Mobile devices.